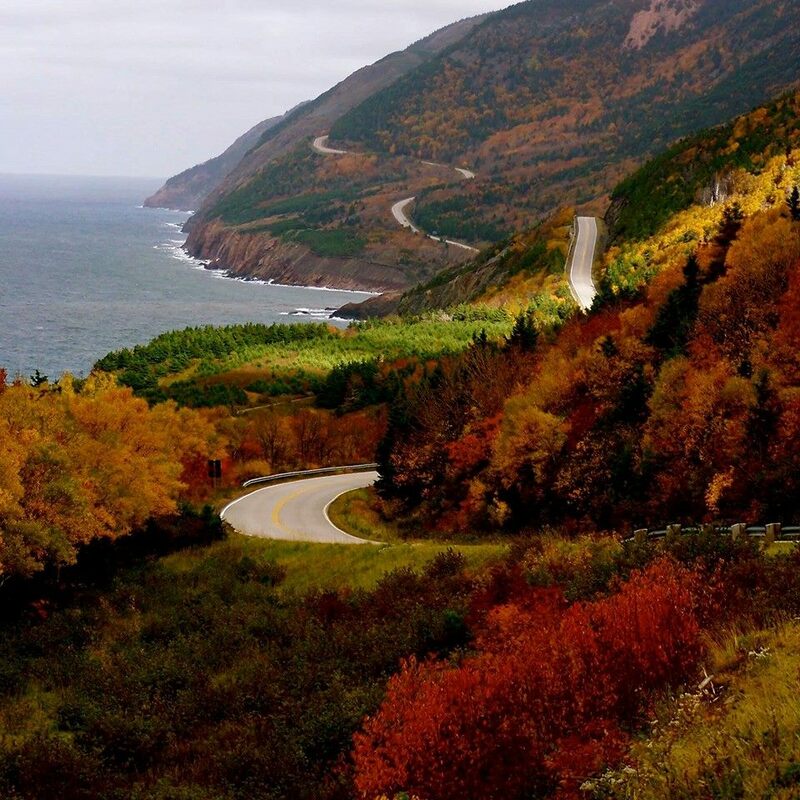 A photo of what Cape Breton Nova Scotia looks like right now, with the leaves having turned colours. It is often said we live in one of the most beautiful places in the world. I forget that, sometimes, until something like this reminds me. In addition, between my friend Joe in Atlanta and myself the image of the moose has been recurring. First as a foot high ceramic moose I bought for my brother’s birthday in June from an antique dealer. Then the ceramic moose ashtray I bought last week at Value Village. Shortly after I sent a photo of it to Joe, he gets an email from a friend saying he had just shot a moose, with a photo of said moose attached. And then, while in an art auction house picking up some work he had bought, he is shown two giant moose head trophies protruding from the wall. He was even going to buy one, but his moral stance on shooting animals (plus a ridiculous price tag) prevented him. Now he is trying to buy antlers, those that fall off the moose’s head naturally after rutting season. He also tells me his daughter used to sing a song called “Da Moose” when she was a child, and this was echoing for him now. 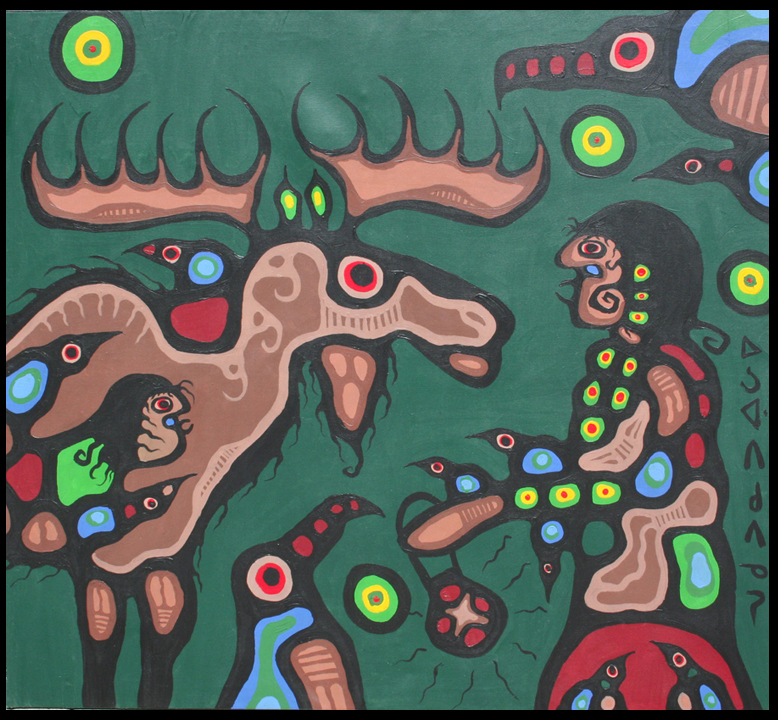 I myself found this lovely painting by the incomparable Norval Morrisseau, called Moose Spirit Speaks to the Artist. This, I think, is the best the moose meaning may resolve for me. I am going to try and find and buy the print and put it in my home. Neither of us are sure what all this moose activity means. But a man of spiritual open-mindedness ignores omens and signs and oracles at his peril. Eventually the reason the moose is so prevalent for Joe and I right now will become clear. It is the most powerful of the totem animals, symbolizing, among other things, self-esteem and necessary concealment. Meanwhile, Joe and I have gone from passively accepting the spiritual intrusion to encouraging and pursuing it, he with his antlers and me with my Norval painting. The spiritual life requires active participation in the mystery, especially when we don’t know the meaning. Thus we gather moose objects to us, as talisman, as symbols of belief, and of hope. The world, when we begin to notice the vibration of all things, becomes a most interesting place. Minor scandals and even major catastrophes need to take their place behind a daily deluge of small miracles and visions.